1) I've upgraded my application to Xafari version 16.2.6011.0. I have a problem in inline edit mode in the listview especially columns that uses ASPxXafariDoublePropertyEditor. You can see the screenshot attached that columns are not at the same vertical orientation. What can be done to correct the orientation? 2) Before upgrading Xafari, default property editors of listviews columns were DevExpress descendant types in the model. After upgrading Xafari, default property editors changed to Xafari property editors. Is there any way to revert this default property editors? Is it possible to switch back to DevExpress descendant default property editors ? See below the solution for the issue. As for screenshot, we are going to solve the issue to near future. 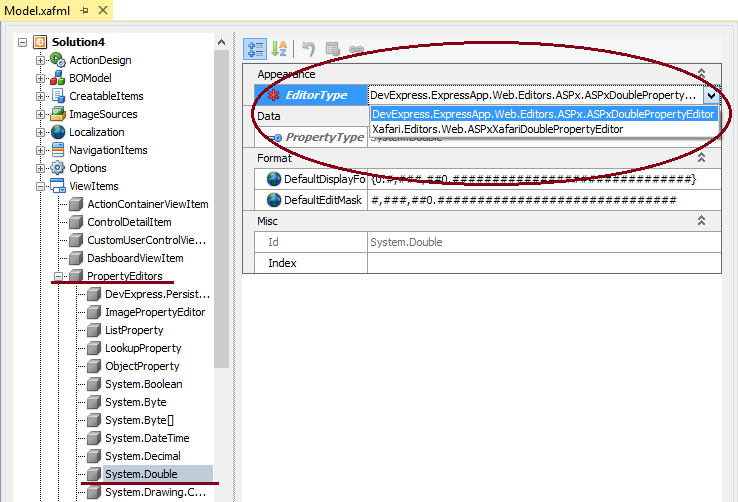 After the manipulation all you properties of Double type will use the editor specified for EditorType.